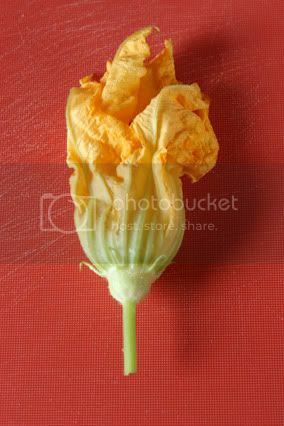 Typically you will find these pretty flowers stuffed with cheese and fried. Or cooked inside cheesy quesadillas. Very yum. But I wanted something slightly different. Last year I had a party at Rivera, a modern Latin cuisine restaurant in downtown LA. 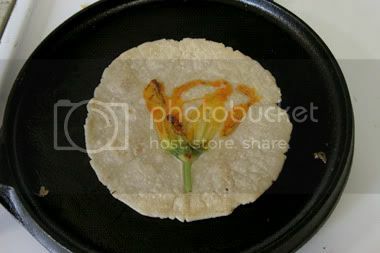 One of their signature dishes is the tortillas florales: tortillas with flowers pressed into them. And that's where the inspiration for these was born. Corn tortillas are very easy to make, even if you're making them from scratch. I bought the pre-made masa at a local store, cutting out one step entirely. 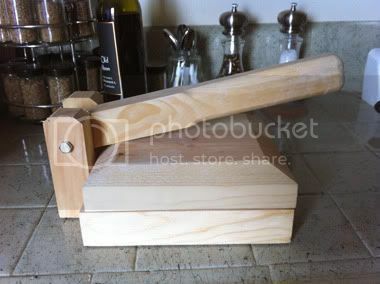 A tortilla press cuts down on the elbow grease too (though a rolling pin will do just fine). It's important to line the press with wax paper or plastic wrap to keep the tortillas from sticking. They'll peel off the quite easily this way. A comal is handy for tortillas too, but you can use a skillet instead. If you've ever pressed flowers in a book, you are already a tortilla making expert. 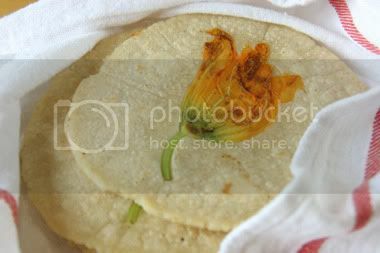 That is exactly how these tortillas were made, right down to the pressed flowers! A tip if you buy the blossoms but aren't going to use them immediately: put them in water, just like any other flowers. Store them in the fridge. They'll keep for a couple of days, instead of shriveling up within hours. 1. Divide the dough into about 10 equal pieces and roll into balls. 2. Place a ball dough into the center of the tortilla press, and press down. 3. 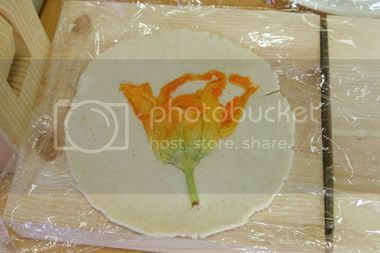 Open the press and place a flower in the center of the now flattened dough. Gently—the flowers are fragile—arrange so the leaves spread out slightly. 4. Press down again, but with only minimal force. You don't want to crush the flower, just embed it into the tortilla. 6. Put the tortillas in a plastic bag or wrapped in a tea towel to keep them pliable. Serve warm. The tortillas will keep in the refrigerator for a few days. Put in a plastic ziplock bag and press out as much as the air as possible. To reheat, simply throw back on the skillet. Or, if you want to do it the way we always have in my house, throw on top of the burner over medium heat and flip with your bare fingers every few seconds until they are pliable again. Take care not to burn your fingers. G+F cannot be held responsible if you hurt yourself in the process. The possibilities here are endless. You can press just about anything edible into a tortilla, or between two tortillas and create something closer to the Salvadorean pupusa. I personally like mine stuffed with cheese. Now excuse me while I stuff my face with more flower tortillas. Mmm. this is super cool . so festive looking too. These are SO GORGEOUS! Cannot wait to try this. Where did you buy the prepared masa? Erika, I picked it up at the Top Valu on Inglewood Blvd, south of Culver. It's about $3 for a small bag.